Continental Airlines just introduced a new service today: Lifetime Flight Miles. It shows all the Elite miles you've acquired since you've joined the Continental OnePass program, and even before, if you belonged to their older frequent flier plan. To me, it was a shock to see close to 400K miles in less than 8 years. My first question to Google was "what's the circumference of Earth? ", which turned out to be 24,900 miles - meaning I could have flown around the world 16 times. And this are just my Continental miles. 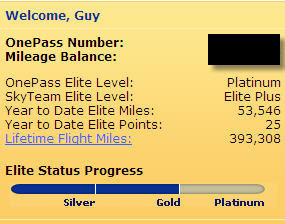 I have hundreds of K miles more with other airlines (not to mention airlines like SouthWest that don't use miles). This just brought home (again) the amount of time I "spend" on planes, at airports, on the way to airports... Such a waste of time. As they say "it's not the years that kill you, it's the miles". PS: Maybe in the future we'll be able to use more remote tools than sending people all over the place. Long live Webex!